For whatever reason, kale is currently the face of leafy green vegetables and I feel annoyed about it. Sure… I eat it, I drink it. But it’s everywhere and I don’t even know what private interest group funded the movement. Rude. No matter where I turn, it seems kale is what the kool kids eat. 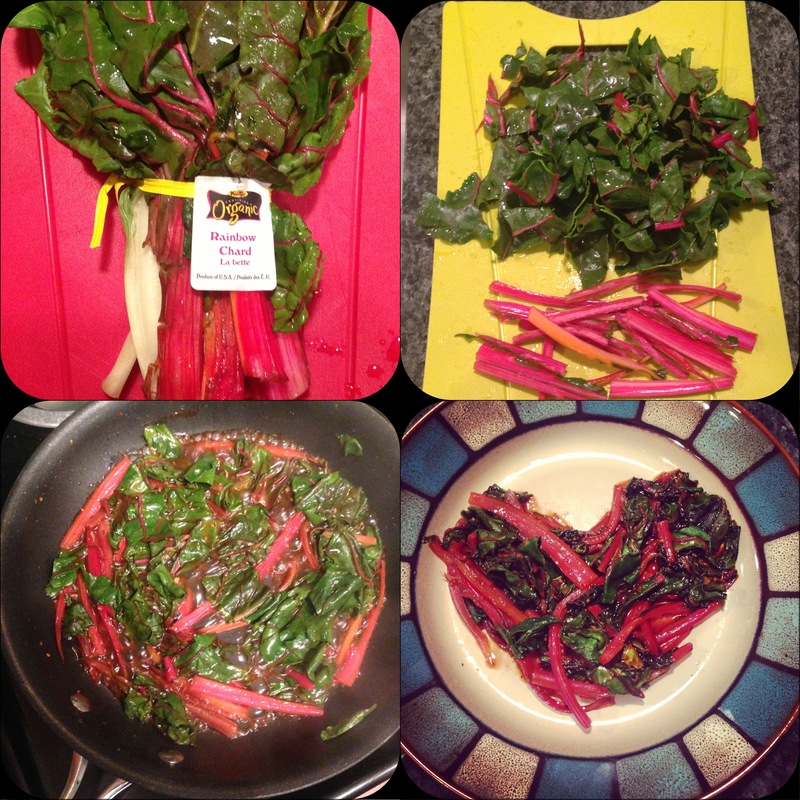 Anyway… Rainbow chard is fun because it’s colorful and you can cook it any way you’d cook the old green staple, spinach or the new girlfriend, kale. I cooked it in the following steps and then I ate it all. Do you dare? 2. Chop the leaves and separate the ribs. Cut them how you want but you’ll see my method in the upper right hand figure. 3. Turn stovetop to just above medium heat and add veggie stock and pepper to pan. 5. Start adding chopped chard to the pan and sauté for about 2 minutes. 6. Place lid on pan & steam for 2 mins. I’m not good at recipes but if you’re lucky, you’re good at remixes. That not only is cool because it’s in a heart shape, but it looks delish! Nice job. 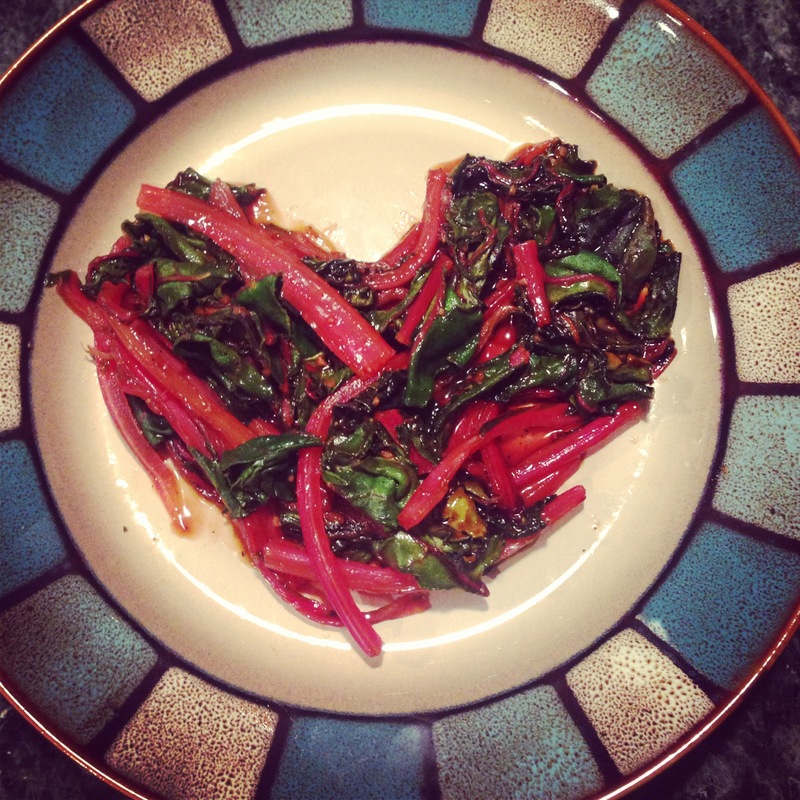 What does chard taste like? I may try to grow that this year. p.s. No one cares about your comment, trinity…find somewhere else to troll. Hi! Sorry, my reply doesn’t have anything to do with Kale, or any other food. But I’m dying to know about Mat’s Love Me or Hate Me tattoo. I stumbled upon the Reds-Indians game on Sunday on TV. I was so excited to see Mat pitching. (I’m in San Diego and miss him terribly.) Then I noticed on his right forearm that he has a different tattoo, right where the Love Me or Hate Me one was. WHAT? I loved that tattoo! So, my question is did the new tat cover the old completely, or can you still read the old one? Glad you are writing this blog–it’s fun to read! Come back. We miss u.